The Caretaker a.k.a. ‘The Guest’ is writing and acting at its very best. The screenplay is by Nobel Prize-winning playwright, Harold Pinter. The remarkable performances are by Donald Pleasence, Robert Shaw and Alan Bates. Pinter’s screenplay is an almost direct transfer of his stage play carrying the same name. The play The Caretaker is a psychological chamber drama studying the dynamics of innocence, allegiance, power and corruption between three very different individuals. It was Pinter’s first significant commercial success and is one of his most celebrated and often performed plays. The quality of the on-screen performances are due not only to the talents of Pleasence, Shaw and Bates, but also to the fact that they honed their parts in 165 performances on Broadway in 1962. Previous to the Broadway shows, Pleasence and Bates had performed the play 444 times in London’s West End. In London, the character of Aston was played by Peter Woodthorpe before Shaw took over the mantle for Broadway. The film exists due to the perseverance of producer Michael Birkett, director Clive Donner, Harold Pinter and the three actors. Having failed to secure any distributor interest, the six partners – eager to get the film made – took the novel step of forgoing payment and seeking investment from friends within the film industry. The budget was eventually raised. Investors included Elizabeth Taylor, Richard Burton, Peter Sellers and Noël Coward. The partners were unable to get the film released in London until it first screened in New York in 1964, despite the film having won the Silver Bear Extraordinary Jury Prize in Berlin the previous year. 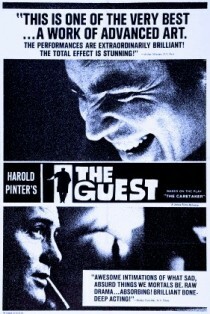 When first screened in New York, the film was renamed The Guest. I don’t understand why, seeing as the play on Broadway had been so successful. It may be due the fact that “caretaker” in American English also means “carer”. Looks like Netflix doesn’t have it. I would have liked to have seen it. Never saw it; it looks great! Thanks for the head’s up…. Your soul just sinks a notch when you see the Americans thought it’d better be re-named. Overthinking it doesn’t work. I was told they re-named John Carter becasue they didn’t want to put people off that it was science fiction. The resultant name therefore tells you nothing. Who knows… maybe it was the British that thought best to rename it. Either way, marketing analysis is not to be sniffed at if it may raise your product’s profile. There are countless movies that I haven’t heard of, but I’m surprised that one with so many talented names connected to it has remained unknown to me for so long.